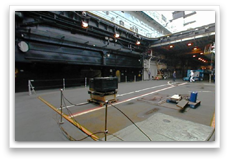 Air Operations in the cramped environment of an aircraft carrier are complex and therefore to ensure that operations are effective, efficient and safe, an integrated organisation is required. Operations would normally be ordered through a flying programme generated by the Operations Officer, and briefings for each sortie were conducted in one of the purpose-built briefing rooms for all personnel involved. All the details of the mission were provided to the aircrew and included navigational data, meteorological forecast and intelligence. The Flight Deck team under the guidance of the Flight Deck Officer was responsible for ranging the aircraft on deck and ensuring all movements were conducted swiftly and safely. They also provided specialist fire fighting teams at flight deck incidents. Aircraft movements on deck, take offs and landings were all controlled by Flyco in consultation with the Bridge, to ensure correct flying conditions were obtained. 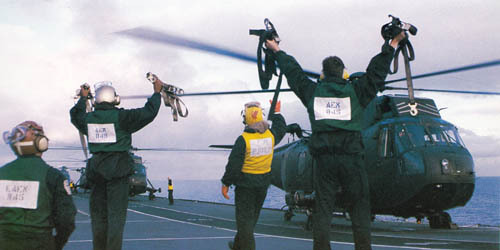 The Air Director and his team in the Operations Room provided Flyco with the current air situation in Ark Royal’s vicinity and they also provided varying degrees of control to aircraft on launch, during the mission itself and on recovery. The Air Traffic Control Officer was responsible for the recovery service to the Harriers in poor weather conditions. 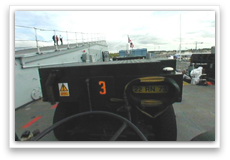 Flyco, situated behind the bridge on the port side, controled the movement of aircraft to and from the deck and was the visual control point for all aircraft out to 5 miles and up to 2000 feet. It was manned during all flying serials by Lt Cdr F (Flying) or his deputy, and overseen by Cdr Air, all of whom were aviation specialists. When at 'flying stations' Flyco liaised closely with the Officer of the Watch (OOW), who had overall responsibility for the ship, to ensure that the time the ship was constrained by aviation was minimised and that the flying programme ran in accordance with command requirements. The duty Lt Cdr F would ensure that during all launches and recoveries a safe deck was available for flying ops as well as setting the deck parking correctly for future launches. Cdr Air/Lt Cdr F were in direct communications with aircraft on the deck and gave them the final permission to land or take off. They would also operate the traffic lights beneath Flyco which signal to the aircraft via a red/amber or green light whether to land/take off or remain holding. 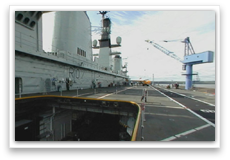 Flyco contained all features common to her sister ships with the addition of extended CCTV coverage to cover the hangar and flight deck. 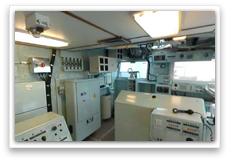 An improved communications suite for Cdr Air was added with additional windows to increase visibility of deck operations. Ark Royal's Flyco position had two rows of windows, as well as overhead windows, fitted in the first refit, which distinguished her from her sister ships. 600 feet long x 100 feet wide (approx 2 football pitches) the flight deck was marked out with numbered spots 0- 9 for the helicopters and a central line for the harrier jets. The flight deck was an exciting and dangerous place as aircraft were launched and recovered in quick succession. All aircraft types could be fuelled and loaded with munitions (rockets, missiles & bombs) within minutes of the order being given to launch. This was also the case for recovering aircraft (Harriers/Helos). Merlin helicopters could upload/download data from their positions directly on the flight deck. If an aircraft encountered a problem on taking off/landing it would be quickly parked in a safe area, the zero spot, to allow other launches to go ahead. Zero spot was known as the 'graveyard'. Aircraft were also usually ammunitioned on zero spot. Without any catapults, all Ark Royal's aircraft, both rotary and fixed wing, could take-off and land vertically. The Navy and RAF Harriers were assisted by the 12 degree ski ramp, which threw them into the air for extra height and lift on take-off. The hangar was approximately 400 feet long by 100 feet wide - about the size of 1 1/2 football pitches. Associated with the hangar were a number of aircraft equipment workshops to test and repair engines, electrical and electronic equipment, weapons and rotary and fixed wing airframes. 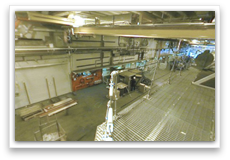 A CVS hangar was divided into 3 sections, forward, centre and aft, by "fire curtains" which could be remotely operated from within the hangar or from adjacent airlocks (in case of a major fire inside) and in the event of electrical failure they could be operated manually. There was also a remotely operated spray system so that any fire that affected the whole hangar can be quickly extinguished. Following her first refit Ark Royal no longer had a 'standard' aircraft configuration but embarked a mix of aircraft depending on the operational role. However most frequently embarked were 7 Harrier jets, 6 Merlin helicopters and 3 Sea King AEW helicopters. If aircraft are to operate safely it is essential that they have an accurate appreciation of the expected weather conditions. The ship was therefore fitted with modern forecasting equipment operated by meteorological officers and ratings and provided the same quality and quantity of data from worldwide sources as any Met Office ashore.